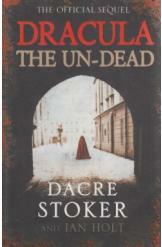 Dracula the Un Dead by Dacre Stoker and Ian Holt Sci Fi, 424 pages, book in a very good condition, all pages intact. The book is based on Bram Stoker's notes, authorized sequel. Fast paced, full of suspense, captivating.